Love love love the new article list! Robert, disgustipated, thanks! Very much appreciated. Pep, the thing with options is they tend to mutliply very quickly and many options make the software harder to use and understand. Even though NewsRob has many options each and every option was a fight ;) And I don't add options to make things a little better, because this is often something very subjective to a small group of people whereby the option would have to be processed by all users. Anyway, back to your specific issue. To create the previews of a 1000(!) articles on an N1 NewsRob would take less than a minute. It processes the images that are already downloaded during the normal download phase. So there is no significant overhead involved to prepare the images. If you configured NewsRob to not download images, then you won't see images btw. Love the app! But content from www.shitmykidsruined.com doesnt show pictures, only text. I tried it on the droid, droid x, and now fascinate. I subscribed to the feed and it works here. What are your download settings? "Articles Only"? Can you post a screenshot? 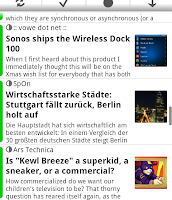 NewsRob syncs with Google Reader. You need to go to Google Reader (http://google.com/reader) and add feeds there. 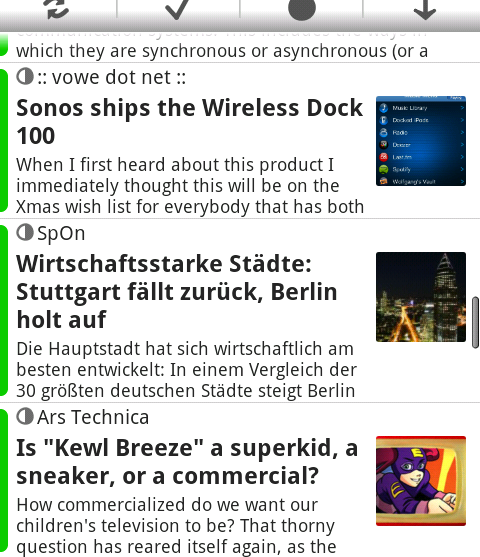 NewsRob will then fetch articles from those feeds. And when you mark something as read on NewsRob it will get marked online too and when you mark something online (on the web app) it will get marked on NewsRob after a sync. Mariano, keep up the good work! I use your app on a daily basis and I'm loving it! Kudos! A great app, but I have found it routinely hangs when getting the gwt version of some pages. I suspect the page in question is odd in some respect, so gwt is hanging. A complete clean of cache and SD dir doesn't help. Can I get a debug option to find out what it is trying to download? You can also switch to Instapaper in the experimental settings.